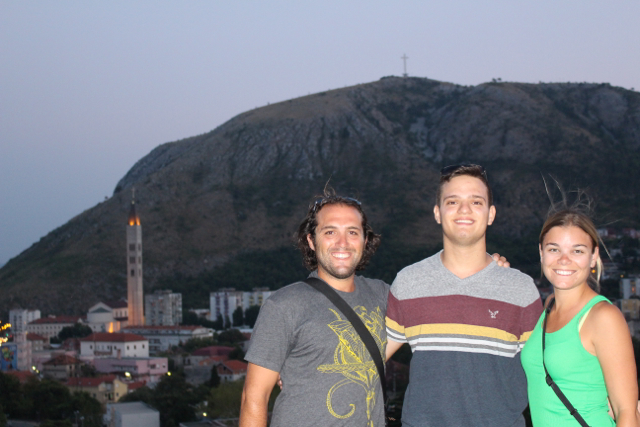 When we decided to travel to Mostar our original reason was to see Ronen’s cousin, Noam, who is studying for the next two years at the United World College in Mostar. 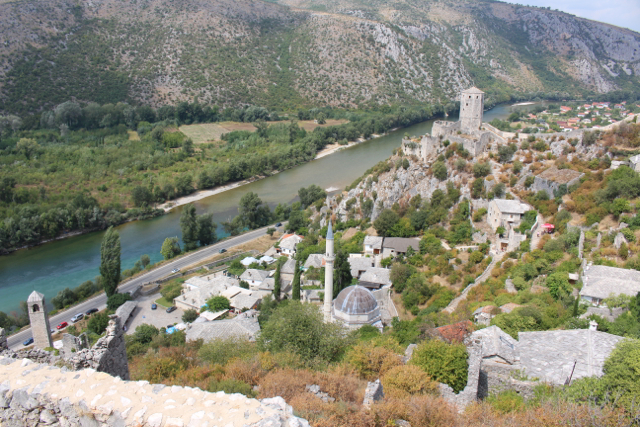 I had never imagined that we would travel to Bosnia Herzegovina and I never dreamed I would fall in love with this country the way that I did. 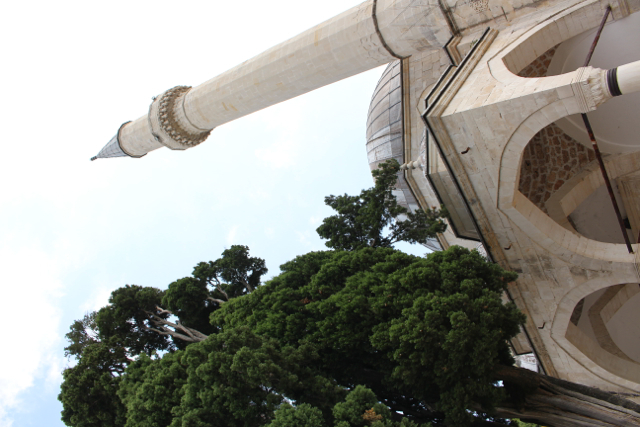 It is a beautiful country and the Bosnian people just add to that beauty with their kind and open hearts. 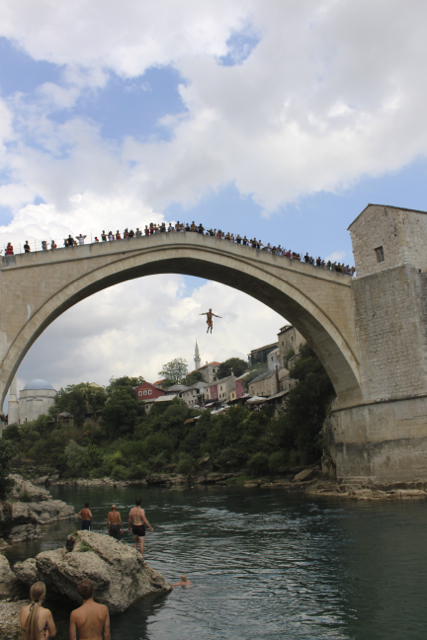 I had such an amazing learning experience while spending two days in Mostar. The city was a war zone just 20 years ago, bombs and mortars exploding every 3 minutes all over the city, most buildings were completely destroyed. I feel as though the survivors should have hardened hearts, in some way they should be cold and distant, but instead, they are some of the kindest and warmest people we have met on this adventure. The city itself still bears the war scars. Some of the buildings remain in ruins to make sure no one ever forgets what happened there. Some wounds are still open, they may have a loose Band-Aid to try to repair the damage, but in order to heal, it really needs some stitches, like the division between the Bosnians and the Croats. I don’t want this post to become a history lesson, but I feel that most people are unaware of what really happened here less than two decades ago and the only way to truly paint the picture of this place, you need to understand its recent history. So, here is the short version. When Bosnia Herzegovina voted to become an independent country from Yugoslavia, Serbia attacked them in order to gain the land and create one large Serbian republic. The Bosnians had no army since they were a brand new country and the burden of fighting a war against trained soldiers fell upon the civilians. 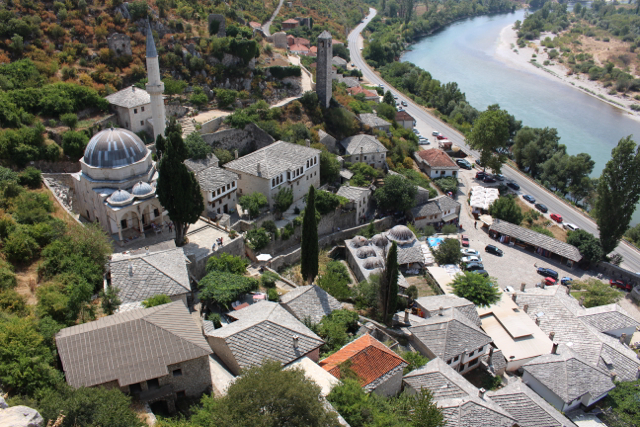 The Croatians were originally helping the Bosnians but they soon decided that they wanted Mostar as their capital and attacked the Bosnians. The Bosnians in Mostar were now being attacked on both sides by two larger armies and they had very few weapons to defend themselves. To sum it up, there was a lot of blood shed, civilians were brutally killed, some were put into concentration camps by the Croats because they were Muslim, others were thrown out of their homes by the Croats who had gained the West side of the city only to be shot by the same Croats while trying to cross the bridge and seek refuge on the Bosnian side. When the war ended with a peace agreement, the memory of the bloodshed was still vivid in the memories of those who had fought and survived the war. 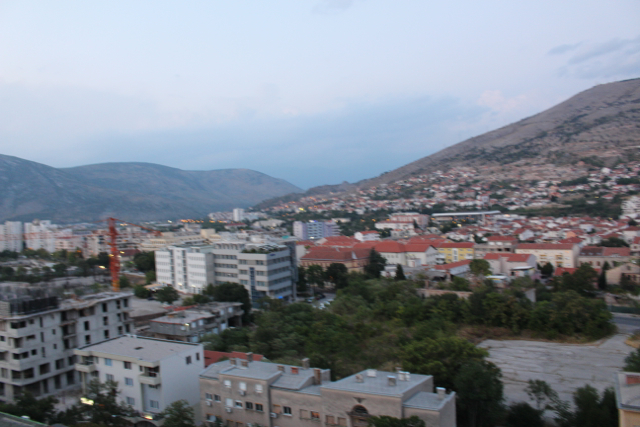 Today, the division of Mostar, with the Croats on the West side and the Bosnians on the East side still exists. Although there is no wall, there is a road that marks the division and both the Croats and the Bosnians mostly stick to their side of the city. We stayed at a great hostel on the Bosnians side called Hostel Miran. Miran and his family were incredible! They were so kind and welcoming it was such a dramatic change from our time in Dubrovnik. We were told of a great spot to eat and met Noam for lunch. We all ordered the traditional Bosnians dish of Cepacici which is little sausages grilled and put inside a Bosnian pita and served with a cream cheese and onions. It was a meal that sticks with you and as we later found out, also does a great job of coating your liver before a night of drinking. Later in the evening we went to the Old Bank, which is one of the tallest buildings in Mostar and it is still in ruins but it provides an amazing view of the city. When we got to the top, it was fascinating to see the differences between the two sides architecturally. The Croatian side is, over all, wealthier and has larger more modern construction and apartment buildings as well as a new mall and churches, while the Bosnian side has smaller homes with the traditional red clay roofs and Mosques. After visiting the Old Bank, we went to enjoy a few drinks and relax because we had signed up for a full day tour of Mostar through our hostel for the next morning. The tour was incredible, it was a wonderful fusion, showing us the beauty of the country as well as the history. I learned so much that by the end I thought my brain was going to explode. 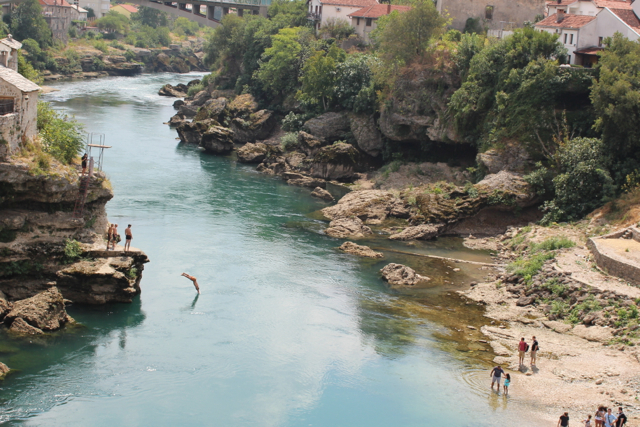 Our first stop was the Blagaj, which is one of the largest sources of water in Europe and is a large cave system. When we were there, we saw a group of divers getting ready with bail out bottles, DPV’s, and doubles and we were really excited about the idea that we might be able to dive in the caves. When we talked to the divers, we were told that it’s a dive club, not a tour company and they have been exploring and mapping the cave system. So far they have explored 700 meters of caves. 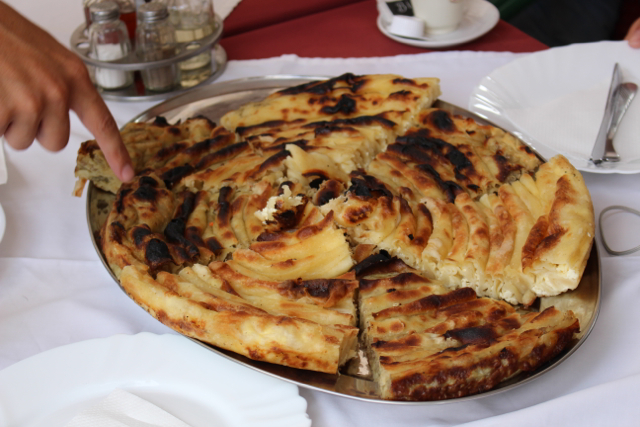 We also got a chance to try the traditional Bosnian pie, Burek. They make the pie with a special oven that encloses the pie in a metal pan, they use coals underneath as well as on the top of the pan to bake it. The result is delicious flaky dough, similar to phyllo that is filled with various fillings, such as cheese, meat, potato, spinach or even pumpkin. 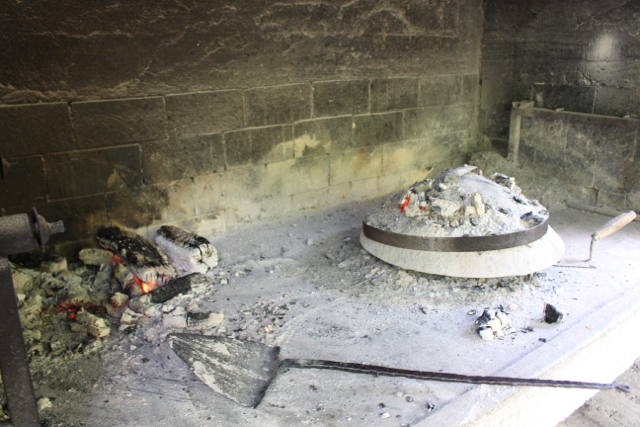 Near the cave of the Blagaj is the Dervish House (Blagaj Tekke), which is significant because in it contains the tombs of the two sheikhs of this particular muslim Tekija or religous building. We were able to enter the house but both men and women had to cover their legs, and women had to wear scarves to cover their heads. After the Blagaj we went to Počitelj, which is a small town with an old fortress on the hills above it. 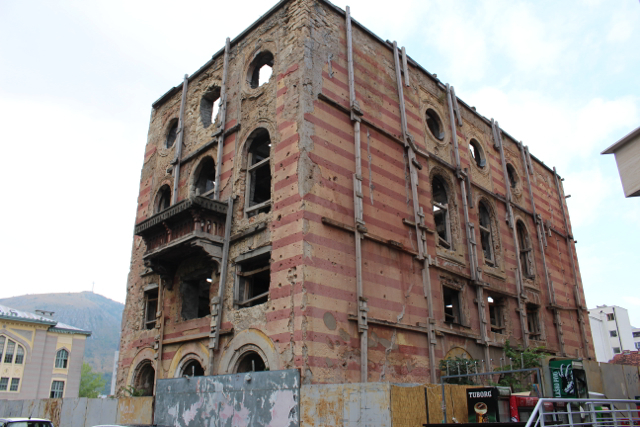 Historically, it was a very wealthy town that was a main trading center since the Ottoman Empire. 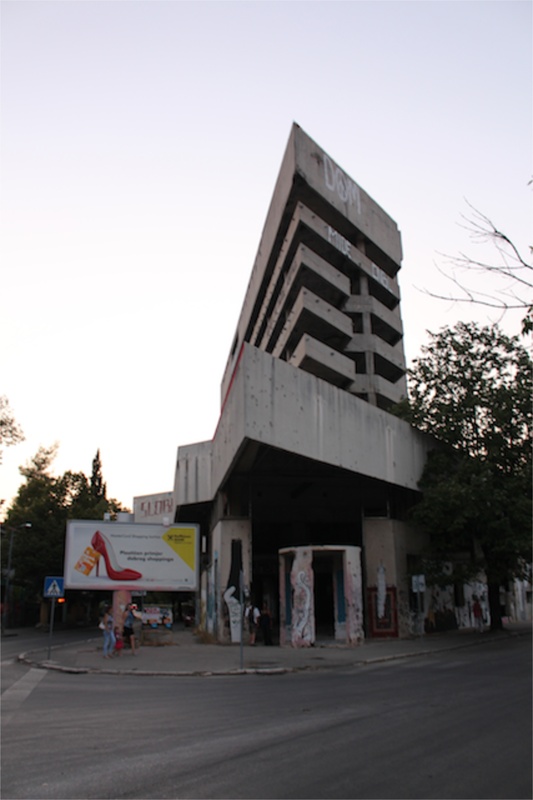 Before the war there were 2,500 inhabitants but the Croatians destroyed the city and now only 38 people remain. 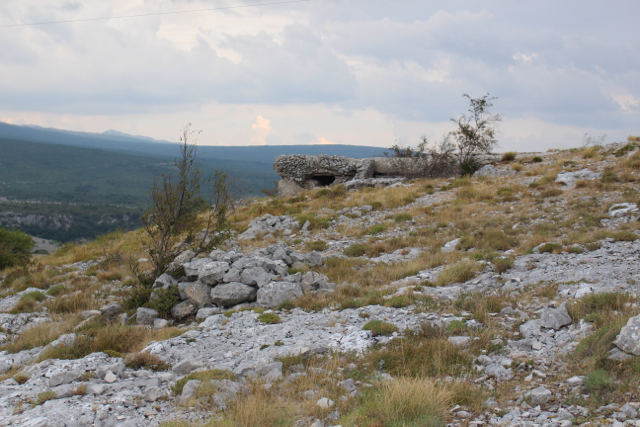 When we were leaving Počitelj we drove through the area that had one of the concentration camps, it was the one that our guide’s father was in for nine months during the war. 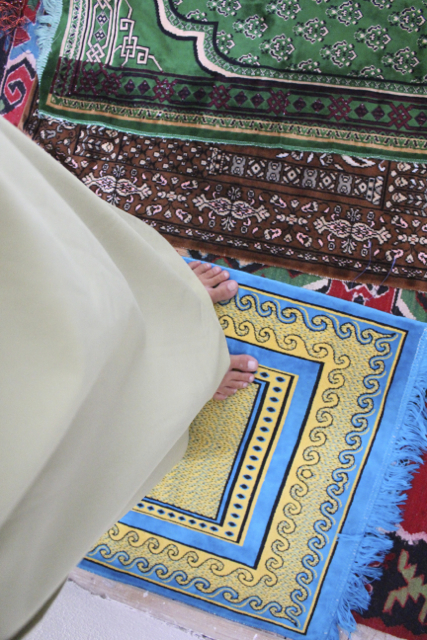 He told us that his dad lost 41 kg in nine months and was only given food once a day, at lunchtime, his hands were tied behind his back and he was allowed to eat for 20 seconds. This was one of the most sobering moments for me. Before traveling to Mostar, I was completely unaware of the atrocities that occurred here between 1992-1995, and at that moment, it was so in my face real that my stomach hurt. 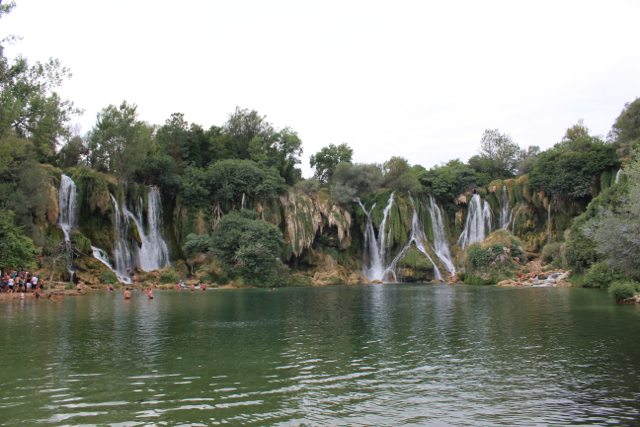 To try to lighten the heavy mood, we went to the Kravice waterfalls. They were so much more beautiful than the pictures showed. We were able to jump off the cliffs into the water and swim, although it was 8 degrees C, and then we drank a few beers, some traditional wine rakija, ate some lunch and relaxed with friends from the tour. 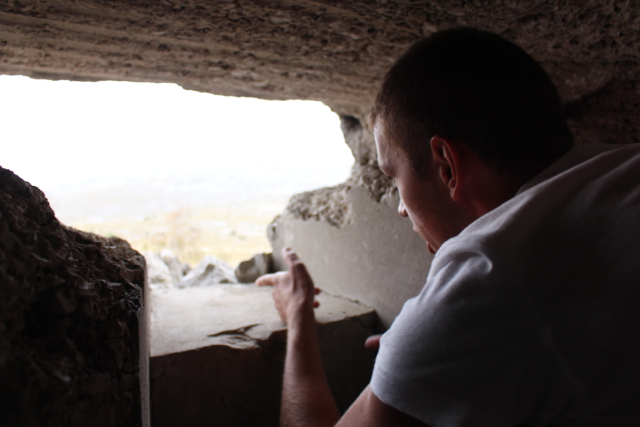 Our final stop of the day was to see bunkers from the war, high above the town. When we were walking around the area we found remnants of mortars, bullet casings, and part of a hand grenade. After an intense day, we had a few beers to settle our minds and went to bed. 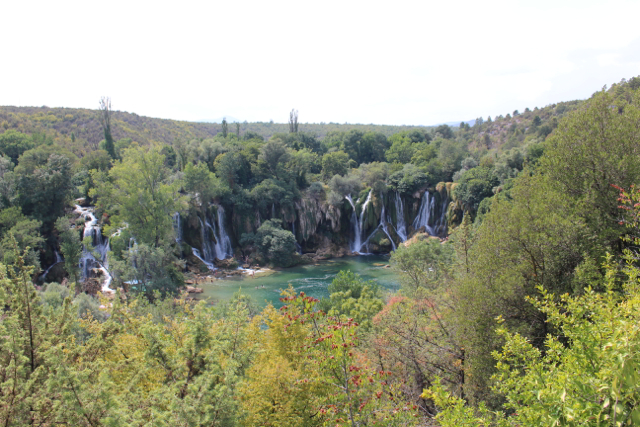 Our original plan was to head to Split, Croatia the next morning but we decided we loved Bosnia Herzegovina so much we booked a hostel in Sarajevo instead. In the morning, we packed and headed to say goodbye to Noam. On the way we walked across the Mostar Bridge. 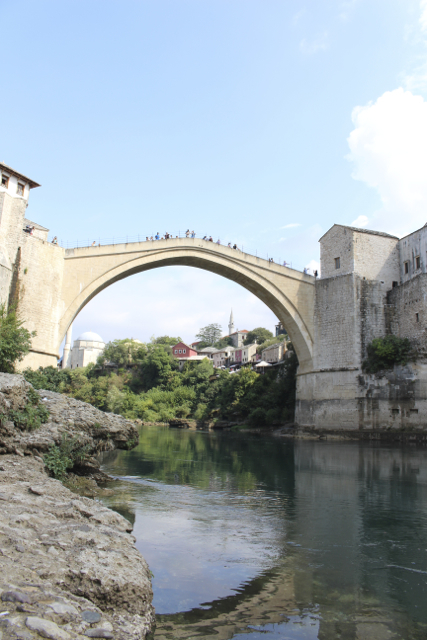 The bridge was originally built in the 1500’s, but was destroyed by the Croatian Army during the war. 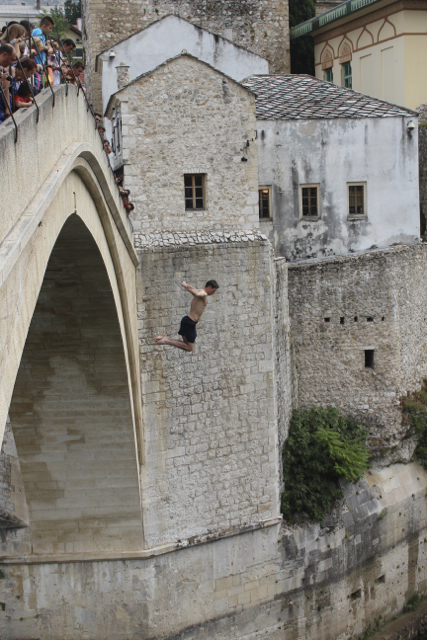 It has since been rebuilt and the tradition of diving/jumping off the bridge continues. The top of the bridge is 22-25 meters above the river depending upon the water level. There are a group of men that collect money and once they collect 25 Euro, they jump off. You can also pay them 25 Euro to jump yourself. They make you go through some training first and if they don’t think you can jump safely, they won’t let you do it. 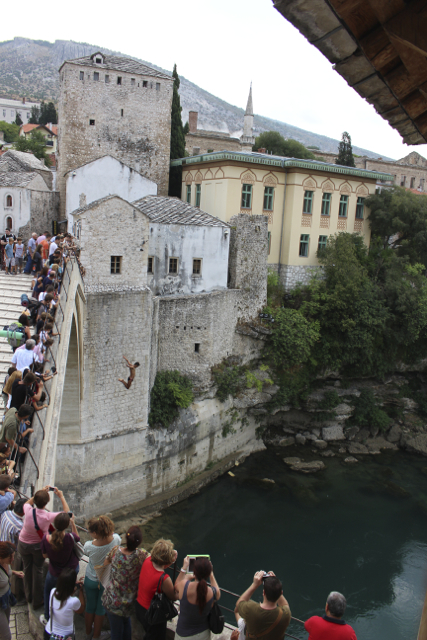 Ronen and I both opted not to jump, but one of the guys from our hostel was jumping so we got a chance to see him take the leap. On the left side of the picture below you can see the practice platform. After a final lunch with Noam, we ran to the bus station and jumped on just in time to head to Sarajevo. 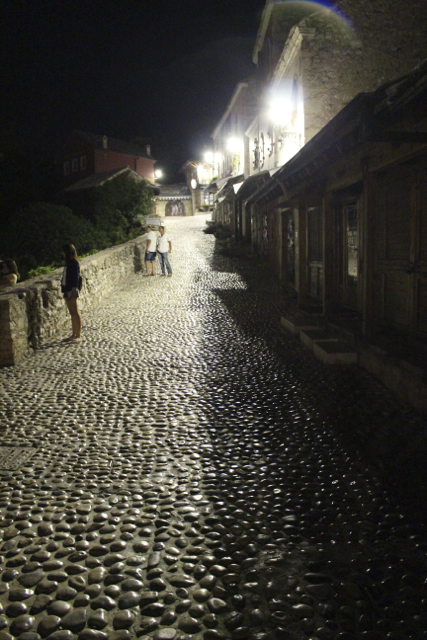 You totally moved me to the core with this heartfelt blog – I am so happy you guys had a “Beyond Belief” experience in Bosnia! That looks so cool. 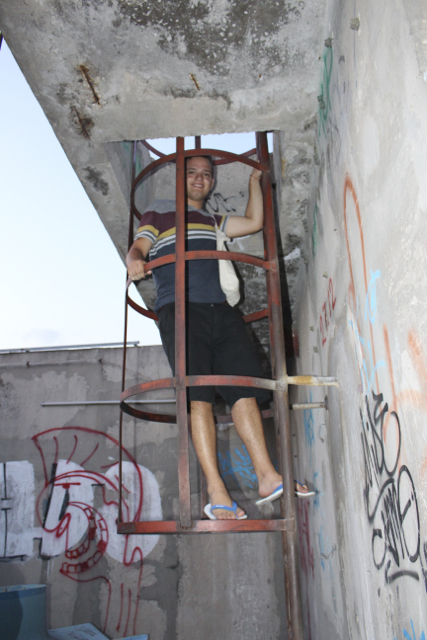 I am surprised Ronen could stay on the bridge. It was hard for him not to jump, but we ultimately decided that it was to big of a risk considering we just started our trip. I think we will go back for Noam’s graduation in 2 years and then Ronen can jump. Nice photos and write ups! I am jealous. The short version on the Bosnia / Croatian / Serbian / Yugoslavian was much appreciated as that war was always confusing to me. Also how it is operating today is interesting. Keep on posting. I love it!!! I am glad you enjoyed it! I felt the same way about the war before going there. I remembered hearing about it when I was younger but I never learned anything about it. It was an incredible place, if you have the chance, you should definitely visit it. We have been having such an amazing time, its hard to fit everything into a single blog post because everyday there are so many incredible experiences. We have been thinking about you guys and we can’t wait to see you in Akumal next November!